There are a few reasons why we have not done any finish work on the interior of the cabin yet. 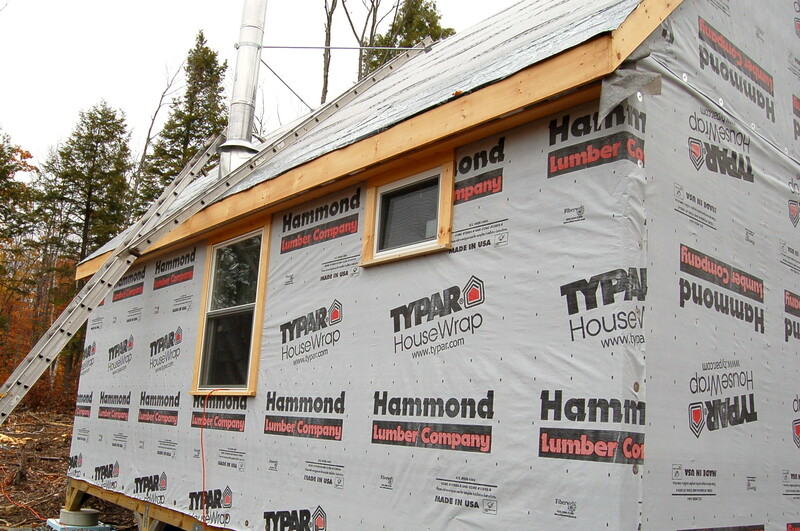 We ran out of money, we couldn’t get building supplies to the cabin over the winter, we were tired of working, and we didn’t really mind how the interior was because we had been living in a tent up until then. The lack-of-finished-interior we had in the cabin was already a huge improvement from the tent, so there wasn’t really a huge rush. It was nice to relax for a little while. Now we are ready to start working again. There are some things around this house that are getting to be annoying. We have no storage space for anything. There are some random milk carton shelves here and there, but nothing really. That means that everything that we use on a regular basis is piled in various spots around our tiny house. I want there to be shelves in the kids room in the worst way. All their toys are everywhere all the time. Many of the toys have mysteriously disappeared, causing our very limited storage space to be full. The kitchen would be another wonderful place for some shelves. We only own about five spice choices because we can’t fit anymore. Once the walls start going up, we can start with the storage building. We plan to start putting the walls up as soon as possible, but we are waiting on some money still. My tax return is taking nine weeks to get back to me for whatever reason so that puts us in to early May. If we were to start putting shelves up now, we would just have to take them back down in a few weeks when we got enough money to put the walls up and do it right. It would be silly to put shelves up now. We do a lot of silly things around here I suppose. The kitchen got a new set of shelves. 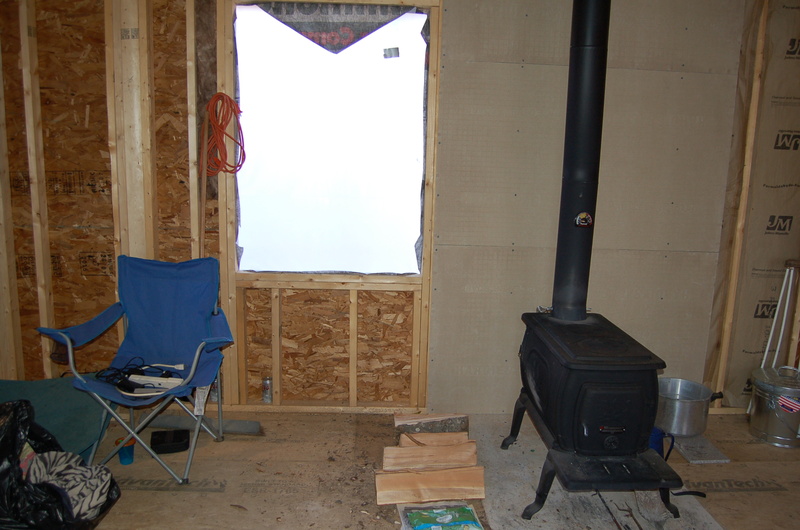 There just happened to be a spot on the wall where we hadn’t even put insulation up and some scrap wood laying around. The man just wedged the scrap wood between the studs in the wall and add a couple of screws. Very simple shelves and very easy to take down. No big deal. So, this is what I got. Not really sure what the point of one shelf is, but I got moaning and groaning about putting more up and having to take more down. I guess it’s valid. But, I wanted more shelves. He came up with this great shelving thing and now we are both happy. It isn’t attached, but it sits nicely on the table top and gives us a little more room until we get the walls up and can have real shelves. 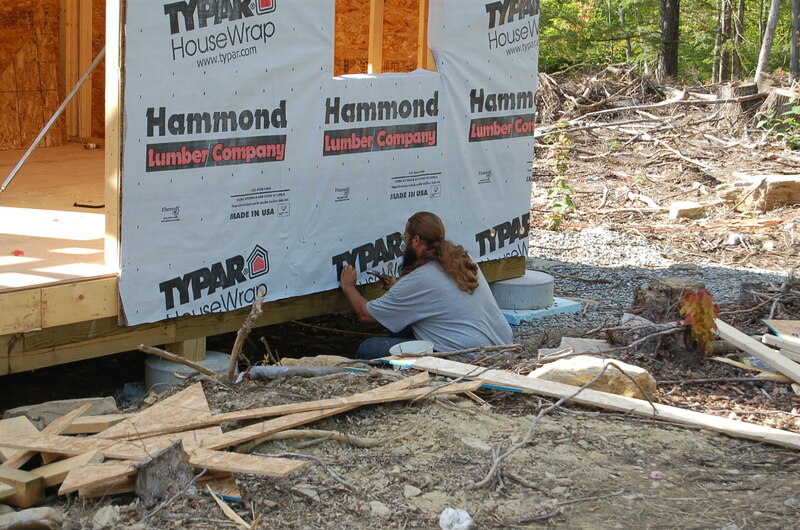 The next step of the tiny house is to get the walls up! There is a path that will take you from the road on one end of the lot to the road on the other end of the lot. The logger had cleared this path to carry the trees out of the woods, and left quite a bit of tree scraps along the way. I have gone out behind the cabin and started trying to make nice piles of all the rotten pieces and small branches. These will eventually become garden beds that will make a beautiful path down to our final home. We are living in the tiny house just long enough to build the house that we really want to be in. I have a tentative five year plan in my head. I will call 2016 year one. That being said, we want to take as much time as we need to build this house so that it can be exactly what we want it to be. We will build the whole house ourselves, maybe calling on some friends to raise the roof when we finally reach that part. We will also need plenty of time to scavenge for building supplies, I want this house to cost us almost nothing beyond the time we put into it. Take a walk down the path behind the cabin. On you right hand side you will pass by a large swampy area with a small stream that drains through it. The tiny stream eventually flows to a small spot where we will soon be able to use it for water collection. It is perfect for baths and dishwater. It would be fine for drinking water as well, but we froze our water filter. Right in the middle of the path there is a small pool that has formed at the edge of the swampy area. The pool is full of frog eggs and tadpoles beginning to emerge. Behind this pool is a small, woody hill. Carved into the side of the hill is the perfect spot for our future home. This house will fit into the hill as though it were meant to be there. The way we will design the house, the intention is that it is meant to fit perfectly into this spot. The idea is to work with the land and have the house fit into it so naturally, that you almost can’t see it. The slope of the hill will hug the backside of the house, adding warmth to the cold winter nights. The front of the house will face south to allow for my greenhouse that will wrap around the front of the house and maybe the side. There will be a beautiful doorway out to the swampy area which will be transformed to a duck pond, hopefully with minimal amendment. It will be like a secret garden, a very peaceful and beautiful place. It will be built using cordwood and beams cut from our land. There will be beautiful archways made of uniquely twisting branches that we gather on walks down to the stream. The flat rocks that are covering the entire lot will be gathered to make flooring for the greenhouse and kitchen. The secret garden will be closed in by willows that will be planted, starting this year, in an intricate crisscrossed pattern that will grow in fuller each year and provide weaving materials. Blue glass bottles that our friends have collected for us will be fashioned into stained glass windows and let in enough light that we will never need to turn a lamp on during the day. However, I have already started looking at antique lamps and other fixtures to put in the house to give a warm feeling all around. After two years of wandering the land, we have finally picked the perfect spot for us to be. I can walk down the oath and just look at the area and imagine the house, it appears right in front of my eyes. I hope to head down soon and put a bench in so that I can sit and stare, and draw pictures of what I want the house to become. However, I am told that I could find a tree stump to sit on just fine. Maybe I’ll stack a few rocks up nicely while I am attempting to make a rock bridge. It is awfully muddy right now and so it is difficult to cross to the spot where the house will be. It is an amazing feeling to know that we wandered around enough to find the spot for the house and hear that spot call out to you. We had both looked at spots a couple times, but when we looked at this spot, it was just it. No question. We are already working on a new path to the spot that doesn’t trek through the mud and interfere with my tiny stream. We actually got the insulation part of this post done a long time ago. I have not had a chance to do any posting lately because I have been too lazy to go to town and use the internet. I have pretty much refused to leave my cozy cabin unless I had to go to work. My days off I stay home. So now I am finally getting this posted. Insulation all over the place keeping us warm. I’m not sure if you can tell in these two pictures, but along the bottom of the picture is the catwalk from one loft to the other. 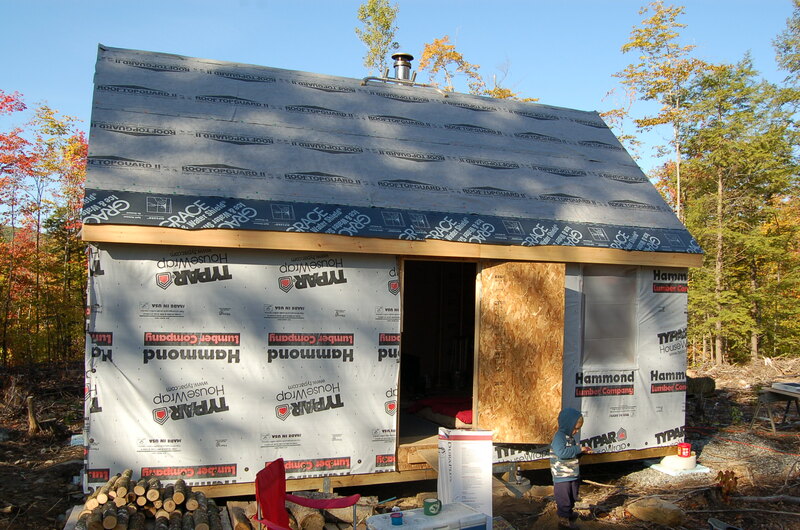 This is where I got to stand to hang the insulation for the roof of the cabin. It was really not a lot of fun. The pink part is the rafter mate to allow for air flow. 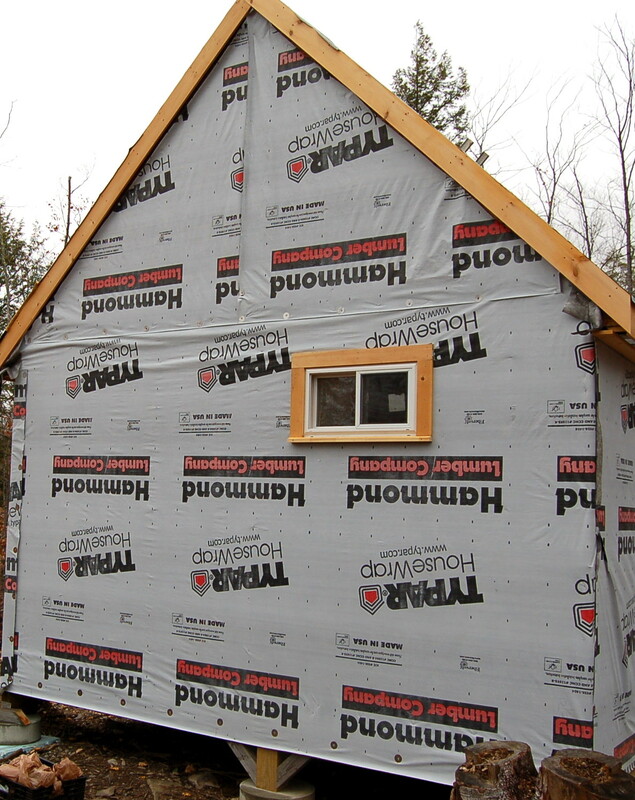 Then I hung the insulation over that. In the bottom of this picture you can see the top of the loft floor and to the right you can see the cat walk. We also got the floor down. We ended up using these 1’x1′ linoleum tiles for the floor covering. They aren’t super nice, but it covers the floor boards. The black floor is in the kids room. There weren’t a lot of designs to choose from and the black ones were cheap. So they are in the kids room under the rug. This is the floor where we stack the wood. It was the very cheapest tile and we knew it would get ruined under the wood anyway, so here it is. This is the floor around the rest of the cabin. It actually looks really good. A couple of the tiles aren’t perfectly close together for one reason or another and we may have to fill in the cracks a little bit. But overall it came out pretty good. Our next step is to put up the wall covering. We are thing tongue and groove pine board. The kids room will likely be plywood painted with chalkboard paint. Who knows when we will get to this though. We are too busy cutting and stacking wood and then doing nothing. The money is also coming i slowly since we have so many other things we still need to pay for. But we are warm and content for now. We really aren’t in a hurry to finish the place off. Everything is just fine the way it is. We will get there eventually, when we feel like it. We’re in! 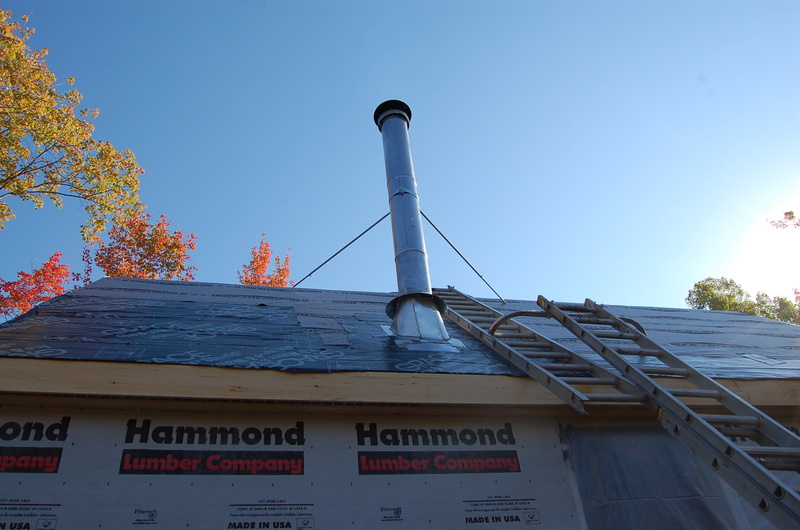 (Like I mentioned before, we have been, but here is the post) We just had to seal up some edges and throw in the wood stove. Just in time too, I was starting to get a little cold early in the morning. Finishing off the weather guard, nailing down the loose edges. 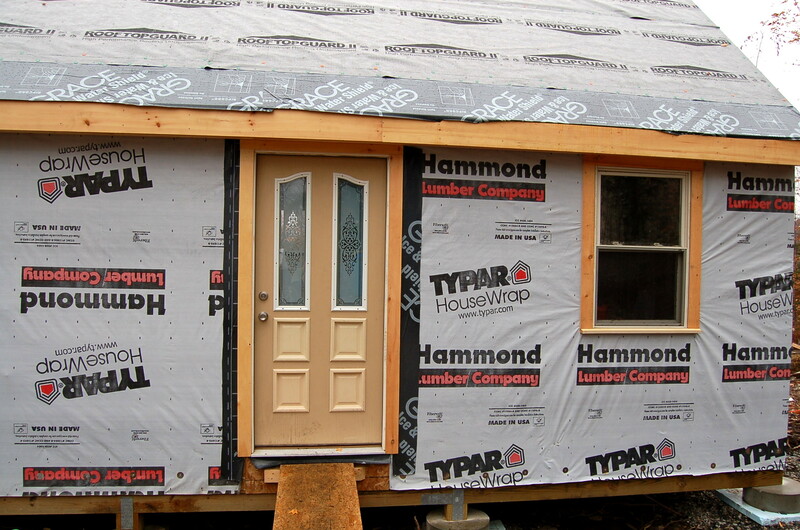 A temporary door and some temporary windows. The heater/stove is in! We cook on this all the time now. I’ll be back to share the photos of the door and windows soon. It’s really starting to be a house!